There are 21 images tagged with “grey”. I thought a lighthouse scene would be appropriate for Easter. I first had the idea for this on a family trip around Thanksgiving of 2016. I was watching the landscape go by and noticed how the smaller trees still had their leaves, and how the dead leaves were almost pink. It may not be as beautiful as spring flowers or autumn leaves or snow, but there are scenes worth looking at even in an apparently lifeless landscape. This hanging on of dead leaves through the winter is called “marcescence”, and it is especially common in young oak trees like these. This is my digital artwork, not a photograph. Sunrise over the Nottely River in western North Carolina. What could be more peaceful and refreshing than a quiet winter sunset? This is the final and most “traditional” of my seasonal snow globe scenes. This is what the landscape around here looked like a week ago. Today was 75° F, so this helps me remember it is still winter out there! 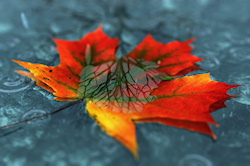 A fallen leaf reflects the tree it came from. 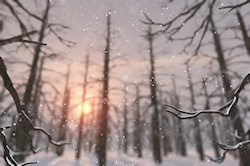 This is another version of my birch woods scene. This is a winter version of Falling Light. I was particularly focusing on the colors and depth of the snow, inspired by a picture from a calendar - Long Forgotten by Michael Humphries. “Resurgam” is Latin for “I shall rise again” - an good inscription for a gravestone, especially in the spring. It seemed appropriate to combine the symbols for death, remembrance, and resurrection. I had been doing some pretty colorful pieces, so I thought it would be good to focus on light and shadow for a change. 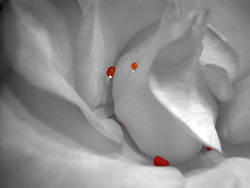 This is a closeup photograph of an orange rose, but I took away all the color except for the water droplets.